Home Products Inc.: Modern Design Meets Functionality! Introducing the Comelit HFX-700M! Modern Design Meets Functionality! Introducing the Comelit HFX-700M! 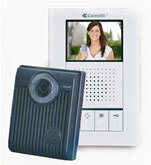 The Comelit Hands-Free Video Intercom System brings innovative technology direct to your home or business. This video intercom is not only convenient to use, but more importantly, provides an additional measure of security for your family. For residential or commercial applications where access control is a concern, the system safeguards your entrance while remaining user-friendly. Comelit intercoms offer peace of mind because users can safely identify visitors before answering the door. Simply by ringing the doorbell, the system transmits live audio and video directly to the monitor. Answering the door is now easier than ever. The Comelit HFX-700M color series intercom is expandable up to a total of 4 monitors or audio only station and 2 doorbells. Monitors and door bells may be installed at different locations of the house according to individual preference. Any monitor on the system has the ability to communicate with the door bell and is equipped with a door release button to remotely unlock a door or release a gate. Modern design meets functionality. That was the philosophy behind the design of the HFX-700M. The stylish yet small form factor is a great addition for any decor. The intuitive design of the system has built in flashing light which will guide the users on what to do at various stages of the communication. The HFX-700M Intercom is equipped with both a 3.6mm wide angle lens for a clear view of the door and white LED lights to accommodate any lighting environment. Without leaving the safety of your home or office, this device allows you to answer the door or initiate a live viewing of your door from any video monitor on the system-even when the doorbell is activated externally. The simple two-wire connection between the doorbell and video monitor makes this system easy to install. Existing wire from old door chime may be used for retrofits; new homes can use any type of wires ranging from CAT5 to 18AWG. NOW AVAILABLE IN KITS TO FIT YOUR NEEDS! Homeproductsinc.com has made the HFX-700M available in kits to help you get the right setup without the hassle of ordering one component at a time. The kits have been pre-built based on typical scenarios and requirements. See available kits below. HFX700M-2 With one doorbell and two inside stations. HFX700M-3 With one doorbell and three inside stations. HFX700M-4 With one doorbell and four inside stations. You can also customize your system by purchasing additional components to suit your requirements. The Comelit HFX700M is the best choice in Video Intercom System!